Raise your hands if visibly large pores are driving you nuts! Sure, they help our skin breathe and eliminate toxins, but pores do get congested due to a build-up of dirt, dust and oil leading them to enlarge. These are common problems faced by each and every one of us. There are a lot of ways you can (temporarily) get rid of or reduce the appearance of large pores on your face. Before we begin, let's start with the basics. Pores are tiny little openings in your skin that release sweat and oil trapped beneath. Some people have larger or more prominent pores than others. They expand and contract due to external factors and look like the texture of the outside of an orange peel. Pores are essential for your skin to breathe and release toxins present in the body. While you can't ever completely get rid of your pores you can always improve their appearance. The appearance of pores can get exaggerated due to a number of external factors. Large pores are caused by a number of external factors like improper hygiene, age, sun exposure, bad quality skincare, make-up and oily skin. - Excessive exposure to the sun: Without the necessary SPF, the sun can damage the collagen present in the skin, giving you larger pores. - Genetics also play a large factor in the size of your pores, some people are genetically prone to larger pores. - As you age, your skin loses the elasticity it once had and this leads to larger pores. - Poor hygiene habits or excessive oil production can also lead to larger pores. People with oily skin are prone to blackheads, making the pores more noticeable. - Bad quality skincare and make-up can also be a cause for clogged skin. - Excessive sweating too can cause large pores. - Hormonal changes are another factor that contributes to large pores. While there are many ways you can 'improve' the appearance of your pores, there is no way to permanently get rid of them. There are just a few things that you can do to ensure your pores are clean and healthy. A daily routine comprising of these 4 steps below will keep all skin issues like large pores, acne and blemishes at bay. A healthy, hygienic skincare routine will ensure you have minimal problems with pores. Cleanse your skin at least twice a day to ensure there is no oil and sweat clogging them up. Use a gentle cleanser to avoid stripping your skin of its pH balance. Use a toner designed for your skin type in conjunction with the cleanser. A toner will further cleanse your pores of any impurities the cleanser missed. This is the best way to avoid problems like acne, blackheads, whiteheads and dull skin. A Cleanse-Tone-Moisturise (CTM) routine will ensure that your complexion is healthy and hydrated. It is the most effective way to get rid of any build up, causing large pores. Use a moisturiser designed for your skin type. A gel-based moisturiser works best for an oily skin type and a cream based moisturiser works best for dry skin types. Exfoliation helps get rid of excess dry flaky skin that clogs your pores. A gentle exfoliant can be used daily for normal skin and if you're new to exfoliation, dermatologists recommend weekly exfoliation for all skin types. If you have excessively oily skin, exfoliation twice a week recommended. This is one of the most commonly believed myths. You can never completely get rid of large pores. You can only reduce their appearance by following a healthy routine and using some treatments that shrink your pores temporarily. Steaming won't open up your pores, it merely helps bring the dirt and sebum trapped inside to the surface. If you have large pores, we would recommend you get a monthly facial to ensure your skin is clean from the inside and out. Don't worry though you don't need to shell out major bucks to fix large pores. If you're looking for some proven relief in the comforts of your home using natural ingredients, we've got just the DIYs for you. Check out some of these home remedies to reduce pores. 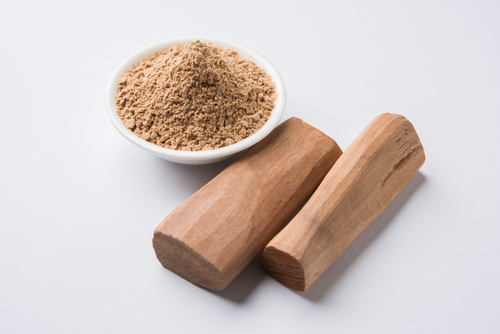 Sandalwood powder and Multani Mitti are the easiest ways to tackle a number of skin issues in one go. They both help brighten up your complexion, fade blemishes, fight acne and tighten your pores. 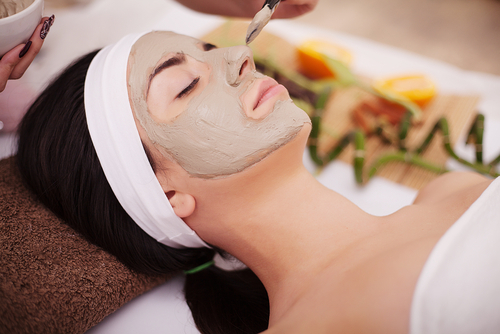 Mix 1 Tbsp of pure sandalwood powder or Multani Mitti with some rose water and apply it all over your face. You could even make a mixture using 50:50 of each ingredient. Leave it on for 20 minutes and wash off with lukewarm water. Your skin will get squeaky clean and will have a subtle glow. Use some rose water as a toner for maximum benefits after you wash off this face mask. Egg whites are known to tighten and firm the skin. They draw out the excess oil, dirt and impurities from your skin and have a temporary tightening effect on wrinkles, fine lines and pores. Crack open an egg and separate the white. Whisk it for a few minutes until it's light and fluffy and apply it all over your face and neck. Rinse off after 20 minutes. Ice improves your blood circulation and helps deal with redness, enlarged pores and inflamed skin. Rubbing a cube of ice all over your face for 1-2 minutes daily is one of the easiest ways to tighten and tone your skin in the comforts of your home. This is one of the most used tricks by make-up artists all over the world! It also helps your make-up go on better. If you're looking for some over-the-counter treatments to combat open pores, there are a lot of ingredients that help with the issue. Consult your dermatologist for a specific ingredient best suited for your skin type. Salicylic acid seeps into your skin, getting rid of the dirt that clogs your pores. 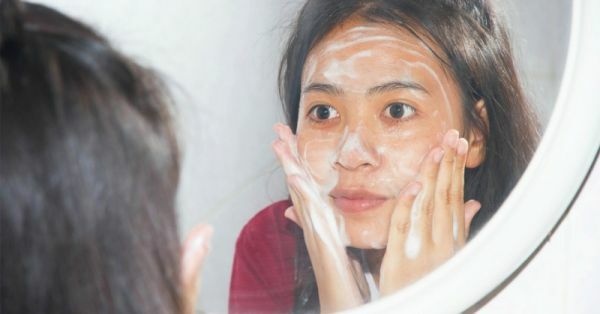 A lot of face washes, face creams and toners have salicylic acid in them to help people with oily skin that is prone to acne, blackheads, dead skin and large pores. 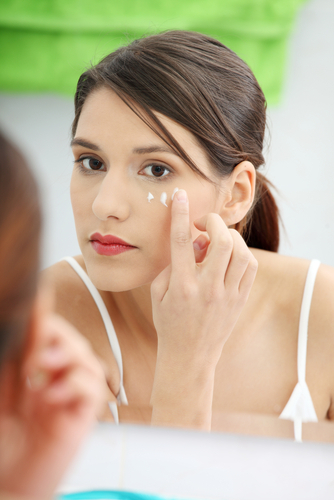 Retinoids can reduce oil secretion in your skin making your pores less visible. Retinoids make your skin very sensitive to a lot of external factors so they should be used only after consulting a dermatologist. Derma rollers help rebuild collagen and heal deep set acne scars and pits caused by a breakout. The roller makes use of tiny needles to puncture the skin and make small holes all over your face. The post-treatment products are usually a range that help your skin heal and brighten. This should only be done by a dermatologist. Laser light therapy helps in reducing the appearance and size of the pits caused by old acne. The effect of lasers on pores, however, seem to be temporary. A dermatologist will be able to guide you for any laser treatments to help with pores and acne scars.